As a nurse, for more years than I'd like to mention, I marvel at the state of medicine and its frequent innovations. It is a great disappointment when illness cannot be cured or injuries repaired. Many people today live with chronic illnesses that would have resulted in death in the not so distant past. And it's the very distant past that I am interested in. What was the state of medicine in Colonial America? Was it accessible, was it affordable and was it effective? Let's take a look. In 1776 the estimated population of the American Colonies was approximately 2.5 million. It is also estimated that in the 1770s there were only about 200 doctors with actual medical degrees. You don't have to do the math to see that the doctor patient ratio was extremely high. Why the dearth of degree'd doctors? The first medical school in the colonies did not open until 1765 in Philadelphia. English trained doctors were part of the early migration to New England but their numbers dropped rapidly. There was little profit and lots of hard work and they either returned to England or died and were not replaced. So, who did the doctoring? Ships surgeons, barber surgeons and apothecaries were all known as Doctor. They had little formal training, some were self taught others trained on the job, apprenticeship, with more experienced 'Doctors.' 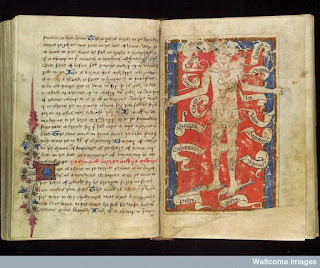 There were medical treatise that could be studied if one were literate. There were also plenty of quacks and charlatans, happy to sell you a cure for what ailed you. Midwives saw to childbirth, and often provided pediatric care for young children. They held a monopoly on women's reproductive health well into the 18th century. The average housewife would often have to rely on only her skills, or her neighbors skills at healing, apply any known herbal remedy they deemed effective. The role of the barber surgeon in health care rose in prominence in the middle ages. They even formed their own guild to oversee their members. Typically the barber surgeon could give you a trim, pull your teeth, lance a boil or do a spot of blood-letting. The last barber-surgeon in England died in 1821. A barber surgeon with his own establishment would put out a red and white striped pole. Red represented blood and white bandages. The barber surgeon would also treat traumatic injuries received in battle or by accident. 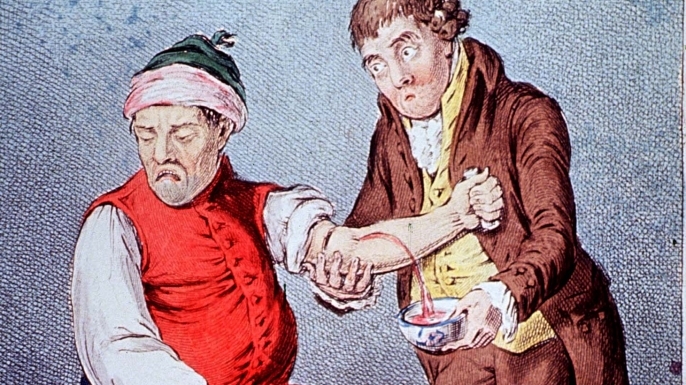 Blood-letting is one of the oldest medical treatments for illness. It is believed that the practice began in Ancient Egypt and spread to Greece and then on to the rest of Europe. Blood-letting was the treatment of choice for everything from the plague to gout, it might even be used to aid childbirth. It is possible that excessive blood-letting for a sore throat led to the death of George Washington. 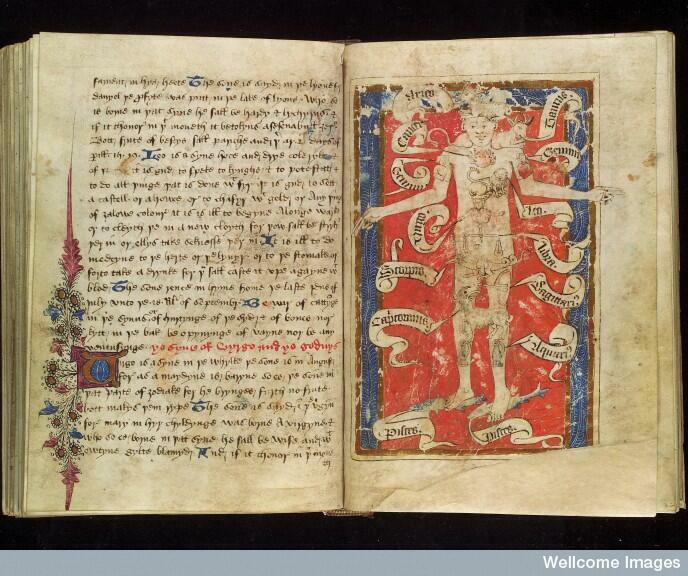 The reasoning behind blood-letting had to do with the belief in the four humors of the body. Black bile, yellow bile, phlegm and blood. If you had some sort of inflammation, like that caused by a sore throat, blood-letting would reduce it. Like the barber surgeon, the apothecary had a sign to identify his business; the mortar and pestle. 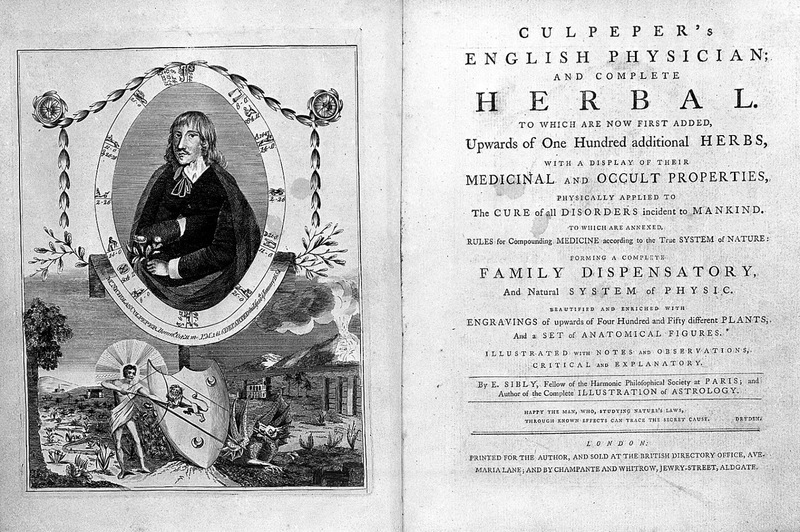 An apothecary often compounded his own medicine. He would diagnose, prescribe and treat his patients. Treatment was based on folklore, tradition or gleaned from medical books. American apothecaries were also interested in the medicines used by Native Americans. Occasionally the treatment was actual beneficial to the patient. Chalk was given for heartburn and chinchona bark was used to treat fevers. Chinchona contains the active ingredient quinine, which was used to treat malaria. The apothecary arsenal included opium for pain, salves for skin conditions, poultices to reduce inflammation, tinctures of herbs and other ingredients, emetics that caused vomiting and cathartics that induced diarrhea and willow bark which actual did reduce fevers. More often than not, the treatment was likely worse than the illness or contributed to the death of the patient. 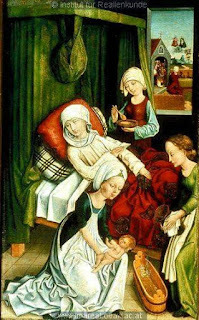 Midwifery was the only recognized role for women in medicine. The first new Americans were born aboard the Mayflower, delivered by a midwife. Childbirth was a risky business no matter how many children one had, each time the mother's life was at risk. Midwives were trained by other midwives, learning on the job. Some towns hired women to work as midwives and even furnished them a house and paid them a stipend. She was a reassuring presence during a dangerous event. One unique role of the midwife was to press unmarried women into revealing the father of their child. It was believed that a woman in the throes of labor would not lie. Midwives might also baptize babies they deemed unlikely to survive, testified to dates of deliveries, and examine female prisoners who claimed pregnancy to avoid punishment. Although life was tough in New England, life expectancy rose for the early immigrants. Was it the cold weather, less crowded living conditions? The first hurdle to a long life was surviving childhood. Mortality rates were high for children. In 1800 40% of children died by their first birthday; a grim statistic if ever I've seen one. Once out of childhood men stood a good chance to live into their forties. Women faced the hurdle of surviving childbirth while men contended with farming accidents and during periods of conflict battle related injuries and deaths. Despite this, many New Englanders lived into their 70s, 80s and older. In the days before antibiotics, many people died of infectious disease. Smallpox, measles, yellow fever, scarlet fever, influenza, pneumonia ravaged New England. Something as simple as appendicitis could take a life. Imagine having a UTI, and no antibiotics to stop it in its tracks. Diarrhea caused by any number of infectious disease was also a killer. Of course due to a shorter life expectancy and a more active lifestyle they did not have the level of chronic illness that we suffer from, but some did. Like other post that I have written on the everyday life of our ancestors, I thank my lucky stars that I did not live in a pre-antibiotic world.